Identity of Akubra man revealed! I'm pretty excited about this post. There's no need for an introduction, so I'll just dive right in. On the morning of my first Finke Desert Race I arrived early. The sun was just rising and there was a thick fog starting to disapate. 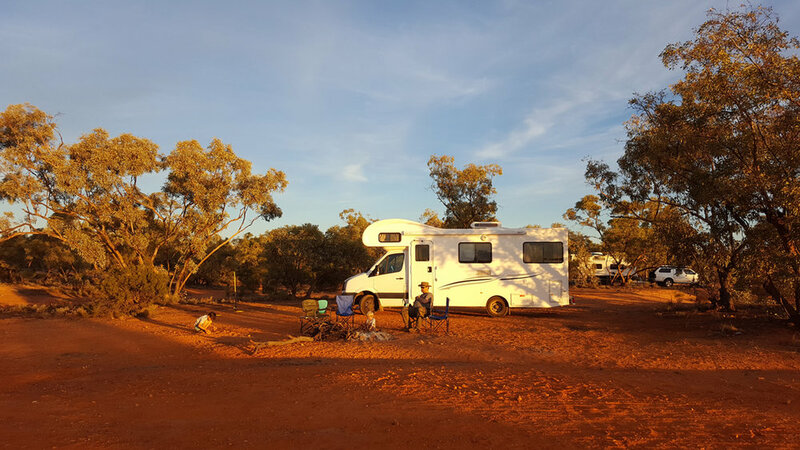 Through this beautiful scene I spotted a lone campervan near the Finke track, with a figure in an Akubra strolling towards it. I took a photo, which I started referring to as Akubra man. Some of you might remember it from my Finked blog post. I remember admiring Akubra man on that chilly morning. The motorhome told me that he'd travelled to be at the event, and his iconic hat gave him a cool Australian swagger. Who was this mysterious bush man? Where did he come from? Was he alone or with friends? What kind of beer does he drink? I put my questions aside and focussed on shooting for the rest of the day. The identity of Akubra man would have to remain a mystery. Then, a month later, the unthinkable happened. I got an email from Akubra man's wife! I've removed the names to keep it anonymous (and to preserve the mystery), but this is what it said. My husband and I recently attended the Finke Desert Race for his 40th birthday and we came across a photo you had taken of him via the Finke Facebook page. The photo is of a gentleman wearing an Akubra returning to his motorhome. My husband was very excited, I think he was actually hoping it would go viral (lol). Anyway, we were wondering if we would be able to have a copy of it, as my husband thinks that it’s not only a great shot but a perfect reminder of our trip (and his 40th). Thanks in advance, I look forward to hearing from you. How amazing! I was stoked to receive the email from Mrs Akubra, and uncover some more information about the illusive Mr Akubra. After some email exchanges I also received some photos from their holiday with their three Akubra children. What a treat! There is one photo in particular that got me excited, as it was taken around the same time that I took mine. Akubra man's daughter inside the campervan looking at the Finke track. I took my photo to the right of this one. Akubra man sitting outside his motorhome in the beautiful outback. All photos have been shared with permission from the family.